According to Godwin’s law, the pop culture tenet of the Internet age, the longer a discussion goes on, the more likely someone will invoke a comparison to Hitler or the Nazis. This week, South Korean President Park Geun-hye may have provided an opportunity to update the maxim for the times by comparing local anti-government protestors to ISIS (also known as Islamic State). Referring to a mass demonstration that took place in Seoul 10 days earlier, Park compared protesters who hid their faces by wearing masks or other facial coverings to members of the infamous extremist group, calling for a ban on masks at rallies. The protests, directed at government plans to take over the publication of school history books and reform the labor market, saw violent clashes between police and demonstrators, some of whom covered their faces. “Given that the extremists of the Islamic State (IS) group hide their faces, we should ban demonstrators from wearing masks in the future,” Park is reported to have told a Cabinet meeting. Alluding to the recent terrorist attacks in Paris, Park warned of the risk of protests being infiltrated by “terrorist elements,” reported the AFP. 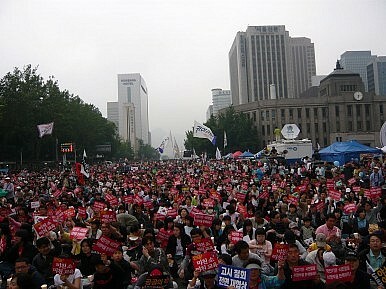 Park’s remarks attracted a backlash from various quarters, not least of all those involved in the protest. The Korean Confederation of Trade Unions, which was involved in organizing the protest, said it was left “speechless” by Park’s comments. Others with no connection to the demonstration made it clear they were similarly aghast at Park’s comparison. A tweet by the Seoul bureau chief of the Wall Street Journal, Alastair Gale, captured what many were thinking with highly evocative understatement. “South Korea’s president compares local protesters in masks to ISIS. Really,” read the tweet, which was shared more than 3,000 times and translated by local media. Fairly or not, Park’s remarks and proposal to ban masks are sure to give further ammo to critics who have long accused her of authoritarian and even fascist tendencies. As the daughter of former dictator Park Chung-hee, the president has been saddled with the strongman image since before her election. Whether or not the president sticks to her position, recent history suggests she is up against South Korean jurisprudence. In 2008, the country’s Constitutional Court ruled it unconstitutional to prohibit protesters from covering their faces. Why Are South Korean Politics So Messy?What's Next for South Korea's Center-Right?Why Ban Ki-Moon Is Not Going To Be the Next South Korean PresidentSouth Korea: People Power Backs Left Into a CornerWill the Saenuri Party Survive Park's Scandal?